You gain 56 points [?] Loyalty program points By purchasing products included in the loyalty program, you gain points, which then can be exchanged to other products available in the store or for a permanent discount. Only available to registered customers. Fabric Details : Top - pure cambric cotton print with self embrodery, Bottom - Semi Lawn, Dupatta - pure mal mal cotton print with pom pom less. Fabric Details : Top - Net (with heavy handwork), Bottom & Inner - Santoon +NET(with handwork moti), Dupatta - Net (with handwork moti). 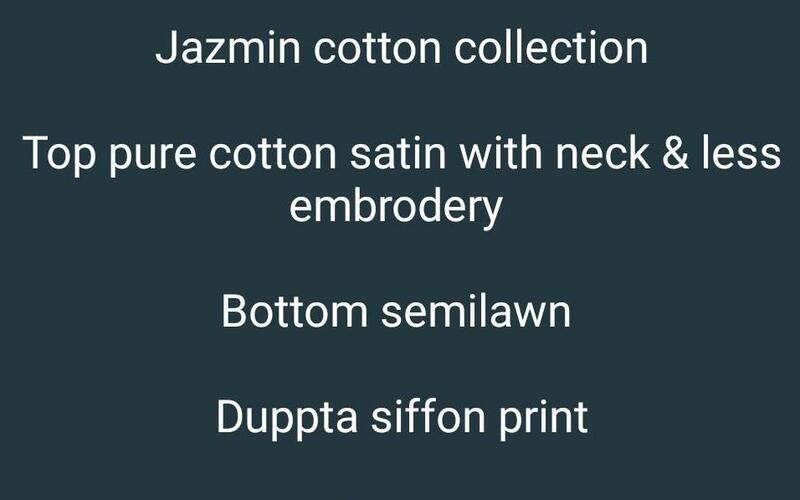 Fabric details : Top - Pure Cotton Embroidered 2.50 Mtrs, Bottom - Pure Dyed Cotton 3.0Mtrs, Dupatta - Pure Mal Cotton 2.25Mtrs. Fabric Detail : Rayon With Top Bottom.